DETROIT RUNNER....: Reminder - Rock CF coming in one month! 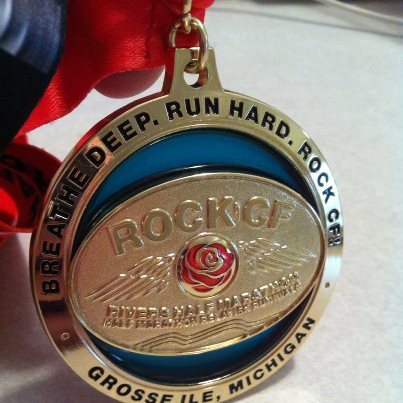 I can't believe it's almost here but, for my first half marathon this season, I'll be running the Rock CF half marathon in Grosse Ile, MI. 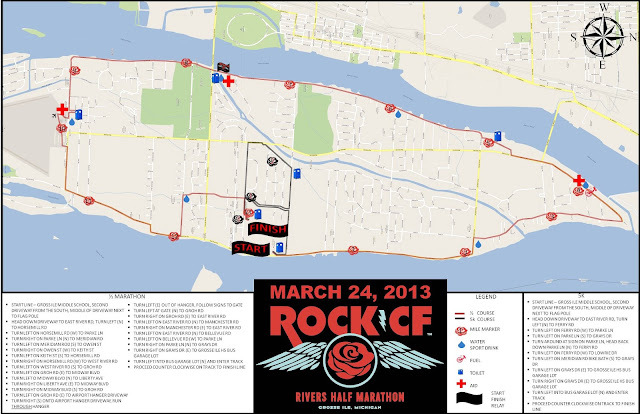 I ran this a couple years ago as part of their inaugural race and it was amazingly organized for a first year race. This year I'm running it as one of their race ambassadors so I'll be sure to take lots of pictures for you to see the course and do a full review after the race. Of course, I'd love to see you come out there and run this one with me as well! Not only is this a great race but this is also for a great cause. 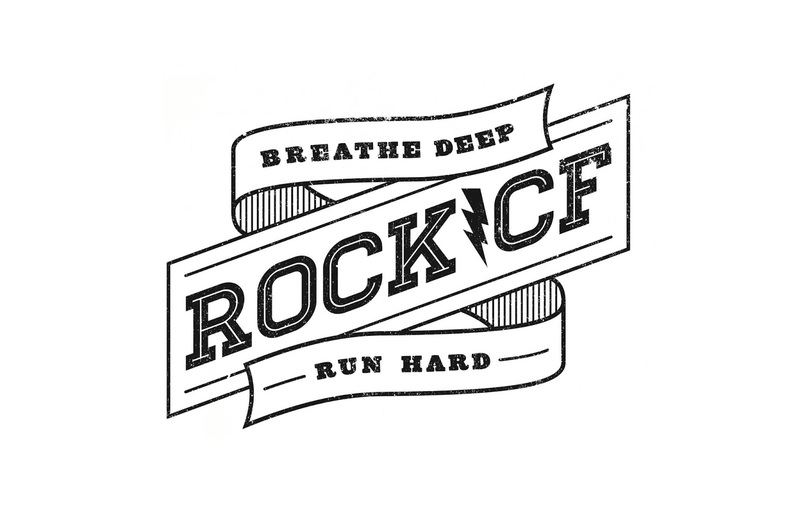 For those of you that don't know, the benefit of this race is for Cystic Fibrosis research. The esteemed race director, who is also a runner, also happens to have Cystic Fibrosis so this cause is very personal to her. It really shows at the race as she puts all her heart and sole into the race for this great cause. If you are interested in donating, you can do that HERE. You've got several options for race day including the half marathon, a half marathon relay(2 runners), and a 5k for runners or walkers. Everyone gets medals and tech shirts which is awesome!!! I love my bling! 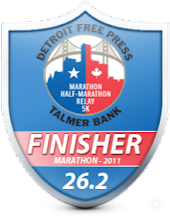 2013 half medal - awesome!!! The course is a fast and flat course. Not only does it go around the island but you will also run through part of the airport this year. Here's a look at the map. As you can see, much of the race, you will have an awesome view. It's one of the more unique courses I've run. Note: The start is near the middle school and not at the high school. There is a short path between the two and it does not take long to get there. You can stay warm before the race in the high school but the middle school will not be open. I remember waiting for the race to start two years ago and being able to stay warm up until race time. It worked our great in my opinion. The red line is the half; the black is the 5k. In regards to parking, you have a couple options. 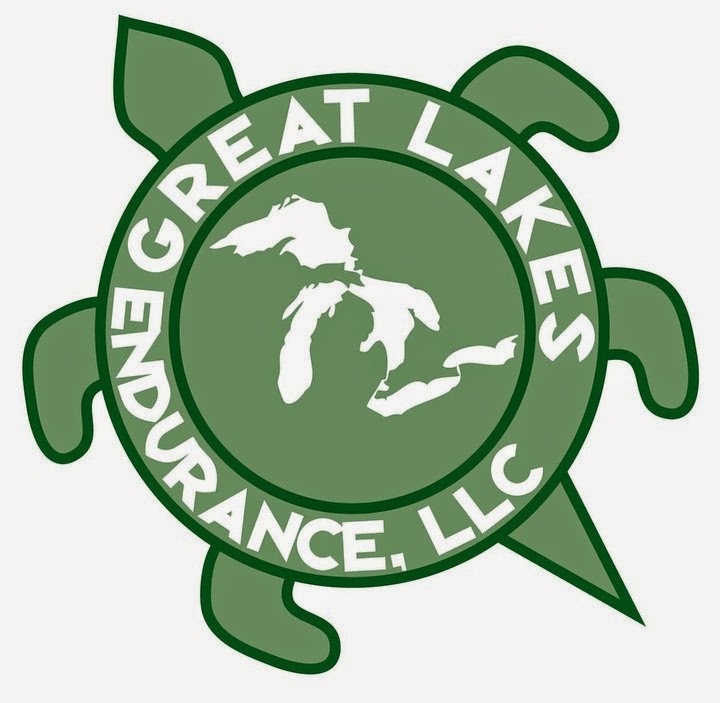 The first is to arrive early(really early), to get a space at Grosse Ile High School(7800 Grays Road, Grosse Ile, MI). I think when I went last year, I got there at like 5:30am and there were already people there! The other option is to park at the Grosse Ile airport. (9600 Groh Rd - follow signs to airport from bridges). The race will have three shuttle busses running so you won't have to worry about getting to the start. The first shuttle starts at 5:30am and runs until 7:30am. Return shuttles start from Grosse Ile High School at 9:00am. One thing that really stood out two years ago was the post race food. They have an incredible spread of food and I can only hope it's half as good as it was then. I really look forward to all that yummy food they provide, much of it homemade. Interested in learning more, registering, and keeping up to date with all the details? 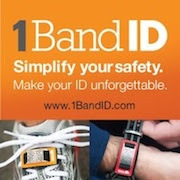 Check out their Twitter page, HERE. Note: I'll bee running this race as a race ambassador so I've received a complimentary entry to the race in exchange for this this post and the post race review. All opinions in this post are my own and I've not be required to give any particular feedback on the race.